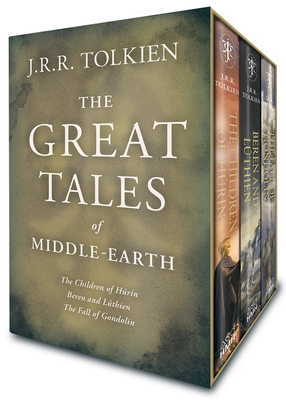 The Great Tales of Middle-earth is a beautiful boxed set of the most recently published novels of Middle-earth: Children of Húrin, Beren and Lúthien, and The Fall of Gondolin, packaged together for the first time. Completing Christopher Tolkien’s lifelong achievement as the editor and curator of his father J.R.R. Tolkien’s manuscripts, The Great Tales features handsome color plates and maps by famed illustrator Alan Lee. ALAN LEE was born in England in 1947. Inspired by Tolkien’s work to pursue his chosen path as an artist of the mythic and fantastic, he has illustrated a wide range of books including Faeries, The Mabinogion, Castles, Merlin Dreams, the centenary edition of The Lord of the Rings, and The Hobbit. He is a winner of the Carnegie Medal for his illustrated edition of The Iliad.